Thank you for choosing South Shore Orthopedics. We hope that the following is helpful to you in understanding our process as well as your patient experience on the day of your appointment. Most patients should expect to be in the office for approximately 45-60 minutes per office visit. Please note that each patient is unique and therefore your experience may vary slightly. Please click to expand each section for more details on our patient process. Free parking is available in the parking lot in front of the building. We are located on the first floor of the building in Suite 102. If necessary, wheelchairs and other assistance are available at South Shore Orthopedics. When you arrive, please check in at the front desk. After your co-pay has been collected, insurance and demographic info verified and paperwork/signatures distributed, you will be added onto our electronic patient tracking board to let our team know you are in the waiting area. If you need a referral as required by your insurance provider, please request one from your PCP prior to your visit and bring a copy to check in. You may receive a phone call prior to coming in for your appointment. If not, your first stop after checking is to visit our historian. You will be asked at this time to provide detailed information on your past medical history. Please bring a copy of your medication list including name, dosage and frequency. Many of our patients will require an X-Ray prior to seeing a provider. X-Ray appointments are scheduled approximately 15 minutes prior to your appointment time with the doctor. One of our roomers or staff will direct you to the X-Ray area as appropriate. For lower body injuries, please plan to wear shorts. Once you are escorted to a treatment room, a medical assistant will arrive and continue the process of preparing your chart for the provider. This will include gathering information on your current injury, understanding what treatments you have received up to this point, as well as other pertinent information. Once the previous steps have been completed and the provider has had a chance to review your file, the provider will arrive for your examination. Be aware that many of the providers will also have a scribe with them. This allows documentation to occur at the time of service in an effort to allow the provider more face to face time with you. Some of our patients will require a visit to our Durable Medical Equipment (DME) room in order to be fitted with an appropriate splint, cast or brace. At this time, one of our Athletic Trainers will assist in fitting and providing you with the equipment recommended by your provider. During this time, you may experience a slight delay as our DME group works with our billing office behind the scenes to check your insurance coverage and DME benefits. Our goal is to ensure you are aware of any associated cost that you might receive prior to us dispensing a product to you. A billing office specialist is also available and on-site to help answer any questions that may arise at this time. 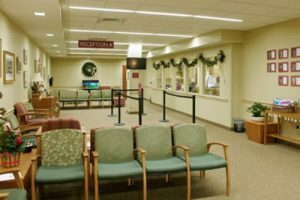 For your convenience, there are four windows located around our two exit areas where patients may check-out of the office, schedule follow up appointments, or schedule surgery as needed. We also appreciate any feedback that you have to share during this time. Within a few weeks after your appointment, you may receive an electronic or paper copy of our Press Ganey Patient Satisfaction Survey. We appreciate your candid feedback as it helps our staff and our management to validate the great job and hard work they do on a daily basis as well as provides feedback on how we can improve our services for all of our patients. Registering for our patient portal allows you to access certain aspects of your medical record, as applicable, communicate directly with the provider teams, refill prescriptions and more. Our patients have noticed significant resolutions to issues and increased communication through the use of our portal.